Toowong Cemetery is the largest cemetery in Brisbane, Queensland. It was opened on 5 July 1875, athough several burials had already taken place prior to this date - Colonel Samuel Wensley Blackall in 1871 being the first. It also contains several earlier headstones - in 1881 the bodies of three children (of guards of the convict settlement) who died in the 1830s were moved from a North Quay site to Toowong along with the original headstones. 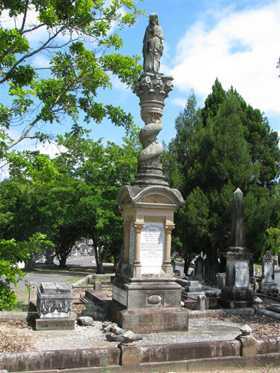 After the Paddington Cemeteries Act of 1911, several remains and memorials were also removed from Paddington Cemetery (Lang Park) to Toowong Cemetery. Though all plots had been sold by 1975 regular burials still take place in family plots and a columbarium has been established. The transcription of Toowong Cemetery Monumental Inscriptions was a Bicentennial Project of the Queensland Family History Society. Transcription was done by members of the Society between 1983 and 1987 and the transcriptions published in 1988.